Luke and I love to have nice breakfasts in the morning. He usually wakes up each morning around 7, while I sleep through to 9. Luckily for me, Luke usually finds the time in these 2 hours to have his morning coffee, read some of his current book, and to prepare a lovely breakfast for the two of us. On busier mornings, we often just pop bagels into the toaster, and we’re on our way. But on most mornings, Luke will make eggs, black pudding (my favourite! ), bacon (sometimes), toast, tea and orange juice. Because he is so great at cooking us lovely breakfasts, I try to do my part as well. These scones are great for lounging-around-the-house mornings, as they are quick to prepare and clean up, leaving you with a heap full of delicious scones, and plenty of time for relaxing. We usually cut our scones in half and top them with margarine, clotted cream, and strawberry jam, but you can really put whatever you’d like on top! Put flour, baking powder and salt into a mixing bowl, and mix until combined. Then add butter (or margarine) and crumble with your fingers until it represents breadcrumbs (you don’t want chunks of butter!). Then add sugar and stir in. Then, add your milk, and stir mixture with a fork until you have a dough. Mine is usually pretty sticky. Divide batter into 6 or 8 pieces, and place on ungreased baking sheet. 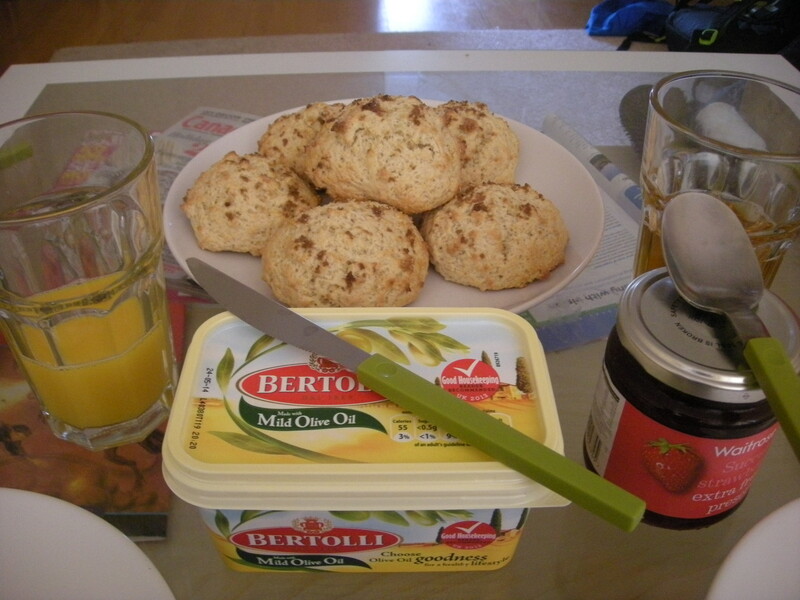 Optional: I sprinkle the tops of each of the scones with some granulated sugar and brown sugar. The granulated sugar will make a little crust (mmmmm) while the brown sugar will melt (double-mmmmm). Bake for about 12-15 minutes, until the tops are medium brown, or until, when poked, the insides feel baked through. * We’ve been in a pinch and found ourselves without butter, but luckily, we found that unsalted margarine works fine in a pinch. Source: I adapted this recipe from prettyinpink’s recipe. 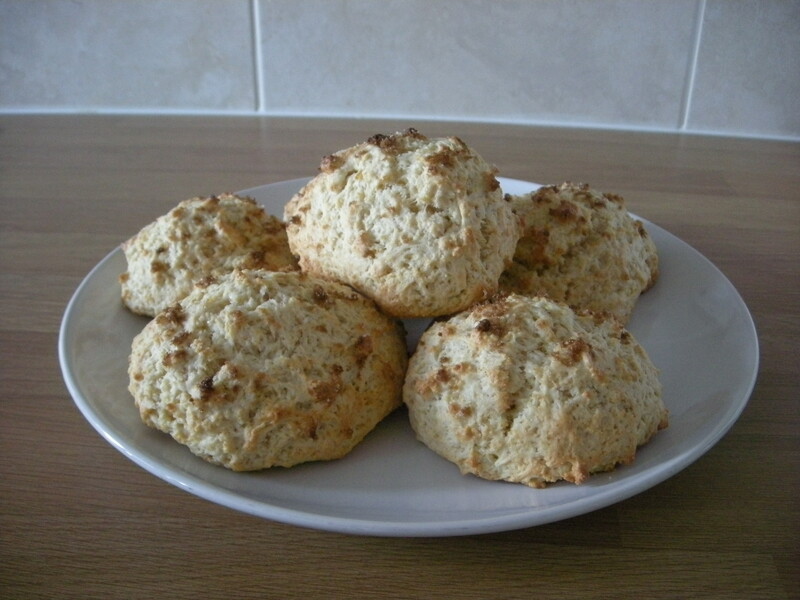 This entry was posted in Recipes and tagged baking, easy, recipe, scones, yummy. Bookmark the permalink.